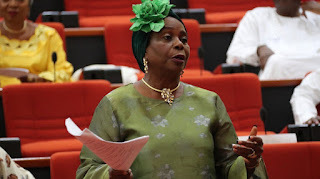 Senate Minority Leader , Biodun Olujimi , has said that Nigerians have no reason to re -elect President Muhammadu Buhari who is the All Progressives Congress ’ presidential candidate in the 2019 general elections . Olujimi , who is the Peoples Democratic Party ’ s senatorial candidate for Ekiti South , said Nigerians should vote in 2019 based on past record and ability to deliver . The senator who was represented by her campaign director, Sanya Adesua , spoke at Ikere Ekiti , Ekiti State , on Thursday during the distribution of Mathematics and English Language textbooks to public secondary schools in her senatorial district . She said , “ President Buhari does not have anything to campaign with as his achievements in the last four years . Maybe that is why he has been finding it difficult to address Nigerians . “ The situation in the country at present requires a leader with vision and ability to put things right . That is where the PDP presidential candidate , Alhaji Atiku Abubakar , comes in . “ For now, we have a President who cannot address Nigerians . We have a President with identity crisis . She said the distribution of the materials was not about election . She said the gesture was about her desire to continue to touch lives .